The ostrich (Struthio camelus) is a species of bird that is entirely incapable of flying. Apart from the distinction of being totally flight-free, ostriches are also the biggest birds on earth. Although these long-necked creatures lack the ability to fly, they make up for it with their very rapid and powerful running skills. 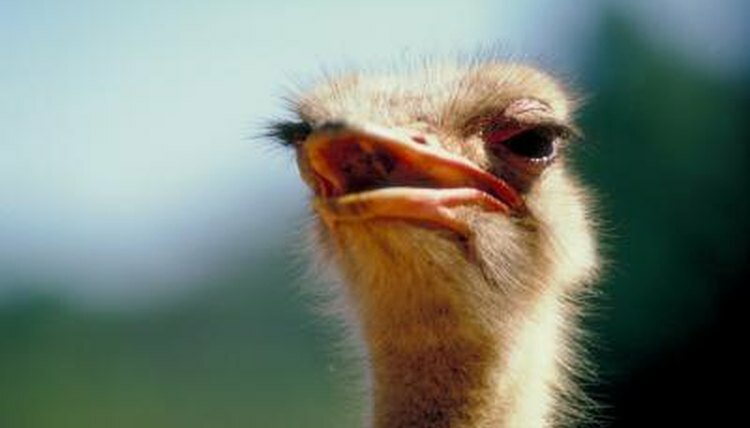 Ostriches come from Africa -- and live in both southern and eastern regions of the continent. The terrestrial birds generally reside further south than the Sahara Desert -- sub-Saharan Africa. Throughout history, these creatures lived north of the desert, however, and also in many areas within Asia Minor. Via introduction, ostriches also live in southern parts of Australia. The towering birds live in sandy and arid habitats, particularly in open country. Common environments for these birds include savannas, woodlands, desert, plains, semidesert, dry grasslands and scrubs. These birds are also prevalent in environments that completely lack trees. Ostriches frequently bathe and swim, and typically stay in areas that are not far from reliable bodies of water. Some of these birds live in solitude, while others are part of units of between 5 and 50 ostriches, indicates the Toronto Zoo. Ostriches are omnivorous birds that consume a mix of meat and plants that they forage, although they usually prefer the latter. Some common elements of the ostrich diet are fallen fruit, seeds, shrubs, shoots, gourds, dry and hard foliage, frogs, roots, plants, tortoises, tiny lizards and bugs such as locusts. Ostriches sometimes feed on rotting carcasses killed by other animals -- no need to do the dirty work themselves. In terms of fruit, ostriches eat a lot of wild figs and berries. They often manage their hydration needs through the consumption of plants. Because of that, ostriches can survive for extended periods of time without drinking H20 -- think a few days or so. Ostriches that live in captivity -- such as zoos -- have very different food sources than their wild counterparts -- the zookeepers, easily enough. Ostriches that live in captivity often consume diets full of components such as alfalfa, hay, commercial pellets, grains and fresh vegetables.